Suggested by Barb Smith of Raymond, Maine. Every year, except when we forget, we include a literary section in the Holiday Gift Guide. 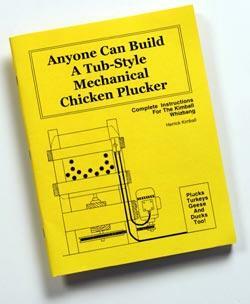 Our selection this year is Anyone Can Build a Tub-Style Mechanical Chicken Plucker (subtitle: Plucks Turkeys, Geese and Ducks, Too!). As the title suggests, this is a sweeping epic novel of love, lust and betrayal. No, seriously, it's about plucking chickens. In fact it's dedicated to a Mr. Ernest Hausen of Fort Atkinson, Wis., who, in 1939, ''hand-plucked a chicken in 4.4 seconds,'' a record that still stands today. We're sorry, but if you can read those words and not think ''This book has to be made into a major motion picture starring Russell Crowe and Keanu Reeves as the men, and Courtney Love as one of the chickens,'' then you have a heart of stone.